1. coclico navy fany heel sandal. $452 . available in store at the perfect pair. 615.385.7247. 2. sibilia large brass cuff. $156. available in store at the perfect pair . 615.385.7247. 3. nisolo lima clutch slate grey. $128. available in store at the perfect pair. 615.385.7247. 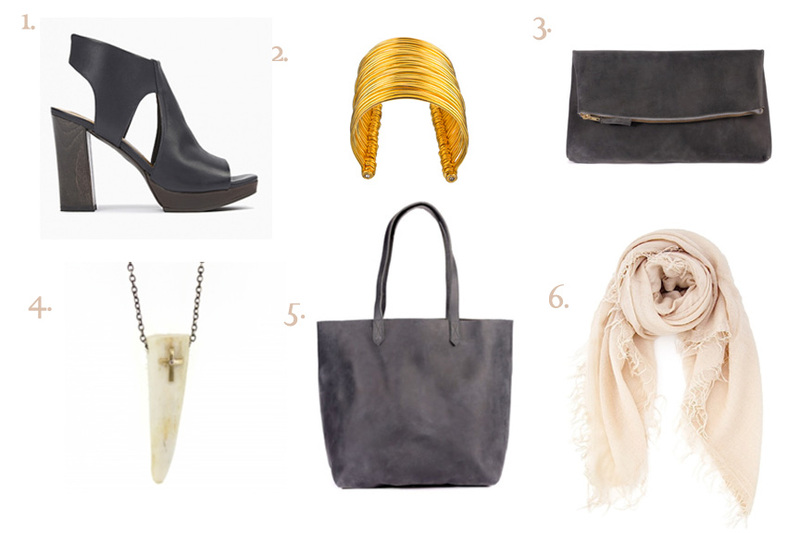 4. rebecca lankford designs antler necklace with gold cross. $312. available in store at the perfect pair. 615.385.7247. 5. nisolo lori tote in slate grey. $158. available in store at the perfect pair. 615.385.7247. 6. chan luu silk & casmhere lightweight spring scarf. $190. available in store at the perfect pair. 615.385.7247.